I made decoupage on this plastic container last year when I was invited to Selamat Pagi Malaysia DIY segment on TV1. The invitation was such a short noticed and I didn’t have enough new materials to display for the TV show. Since there was an empty plastic container at home (the one that people used to get when they buy Hari Raya cookies), I just did a basic decoupage technique on the lid. This color combination of dark blue and white is a great idea for those who want to make something different than the normal sweet, pastel color like pink, soft purple or light green. 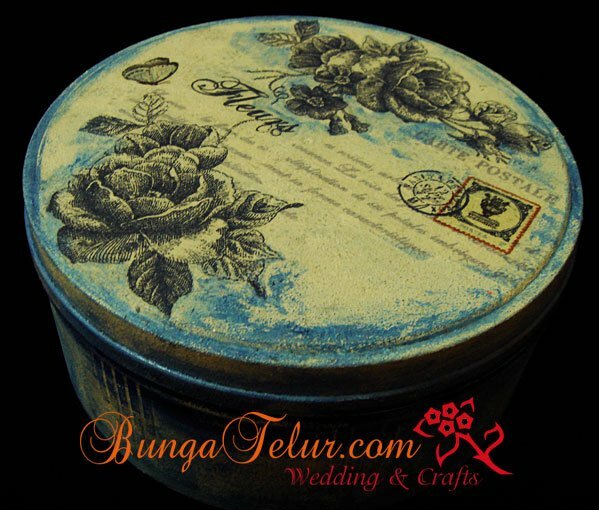 If anyone is interested to learn the basic technique of decoupage using paper napkin/serviette, the next class will be conducted on 17th November 2013, Sunday at 2pm. Please contact me via email [email protected], sms/whatsapp 012.648.2121 for more details.